We talk a lot at Books for Keeps about third-grade reading scores – about how getting a child on grade level and in love with reading by the middle of elementary school is so critical because it can forecast the rest of their educational careers, even the rest of their lives. But by the same token, we’re constantly reminded that it’s never too late to get a student hooked on reading. It was made clear during a conversation last fall with Aliyah, a middle-schooler who – as a new student in Clarke County in the fifth grade – found that her bag of 12 books from BFK transformed her perspective on school. She went from being a student who felt disengaged, whose self-esteem was shot because her reading scores were low, to feeling more confident and excited just to go to class. 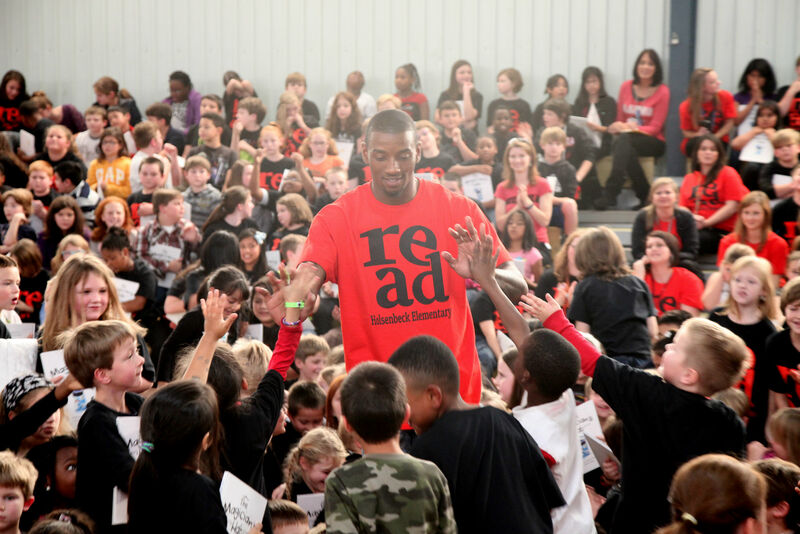 UGA Football wide receiver Malcolm Mitchell’s story is one of those stories, and we have been itching to work with him. We’re excited that those stars are finally aligning. To hear Malcolm talk about his journey is a testament to the power of books to open up new worlds. Before he walked into a Barnes and Noble, as a freshman in college, he had no idea there was an entire universe of children’s books out there. He didn’t grow up with them. But as an adult, he discovered the power of good books, starting with The Hungry Caterpillar and working his way up, eventually joining a book club. He discovered the way books can illuminate dark corners of your life, spur conversations with new people, and totally change your perspective on the world – and yourself. Malcolm wrote a children’s book, The Magician’s Hat, two years ago and has been on an incredible journey since then, working to get that book into schools and into children’s hands. 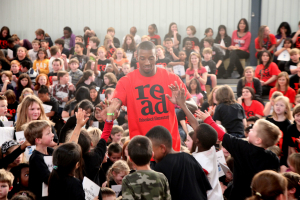 He has held hundreds of events at schools all over Georgia, introducing other young people to the magic of books. He didn’t discover that magic for himself until later, and he is trying to make sure that kids like him – kids with so much imagination and potential – don’t miss a beat, that they can capitalize on their grade school years to fall in love with books. In turn – and he knows this from experience – they can fall in love with learning. He is striving for the same things we are here at Books for Keeps. It’s kind of a match made in heaven. Books for Keeps Executive Director Leslie Hale sat down with Malcolm recently to discuss how Books for Keeps and Read with Malcolm can work together to get his message into more schools, and to get brand new books into more children’s hands. Don’t worry – more news soon. Stay tuned!